Congressional politics at the end of the 20th century became more polarized, and for moderates, their plight became unenviable. Constance Morella was one of a shrinking group of moderate House Republicans who had been so numerous during the 1960s and 1970s. From the first, she built her career around her Maryland district, but the 2000 Census offered an opportunity to recast her constituency dramatically. At the same time she found herself tied more closely to her party after the Republicans took control of the House in 1995, making her vulnerable, as Democrats recruited stronger candidates to run against her. Constance Albanese was born on February 12, 1931, in Somerville, Massachusetts, to Italian immigrants Salvatore and Christina Albanese. Her father was a cabinetmaker, and her mother worked in a laundromat. Constance Albanese attended Boston University, graduating in 1951, and marrying Anthony Morella in 1954. The couple moved to Maryland, where she taught high school. Eventually, they would have three children (Paul, Mark, and Laura) and help raise Constance Morella’s sister’s six children (Christine, Catherine, Louise, Paul, Rachel, and Ursula) after she died. After receiving her MA degree from American University in 1967, Morella taught at Montgomery College in Rockville, Maryland, from 1970 to 1986. Morella also became active in community organizations and was soon serving in a variety of public positions, finding herself attracted to the Republican moderates, as represented by Governor Nelson Rockefeller of New York. She was a member of the Montgomery County commission for women (1971–1975), and in 1974 she ran unsuccessfully for the Maryland general assembly. 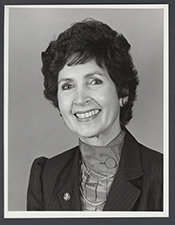 She was elected to the general assembly in 1978, serving through 1987. Morella built her House career by emphasizing those issues of greatest concern to her constituents. She also developed an intense district presence. “Three things are certain in Montgomery County,” noted the Washington Post in 1992, “death, taxes and Connie Morella showing up for every small–town parade and public forum.”4 Morella worked hard to establish a close relationship with her district, developing a reputation for independence while muting her party affiliation in the heavily Democratic district.5 As a result, Morella was frequently on the other side of major issues from the rest of her Republican colleagues. “We’d like her to vote with us more often,” Republican Representative Henry Hyde of Illinois said in 1990. “But to get elected she must reflect her district, and she votes like her predecessors.”6 Her initial committee assignments catered to her district’s greatest concerns: the Committee on Post Office and Civil Service and the Committee on Science, Space, and Technology. During the first part of her House career, she used these committee assignments as the basis of her legislative activities in areas such as federal pay, parental leave, and health care benefits for the civil service. 1R.H. Melton, “Morella: Tirelessly Tackling the Odds,” 29 October 1986, Washington Post: B1. 2Current Biography, 2001 (New York: H.W. Wilson and Company, 2001): 34. 3R.H. Melton, “Morella’s Election a Triumph of Personality Over Party; Democrats Crossover Votes Played Key Role in Md. 8th District,” 6 November 1986, Washington Post : A57. 5Dan Balz and Jo Becker, “Shaping Up as an Amazing Race,” June 2, 2002, Washington Post: A15. 7Brigid Schulte, “For Morella, Independence Carries a Cost,” October 15, 2002, Washington Post: B5. 10Spencer S. Hsu, “Political Spotlight Shines On Morella’s Balancing Act,” 11 March 2002, Washington Post: C8. 13Linda Killian, The Freshmen: What Happened to the Republican Revolution? (Boulder, CO: Westview Press, 1998): 38. 14Jo Becker and Brigid Schulte, “Party Lines Are Drawn on Morella’s Home Turf,” 3 November 2002, Washington Post: C7. 15Dan Balz and Jo Becker, “Shaping Up As an Amazing Race,” 2 June 2002, Washington Post: A15. 18Keith B. Richburg, “Morella Reshapes Local Politicking Skills for Overseas Post,” 26 October 2003, Washington Post: A9. 20Brigid Schulte, “Sad but Stoical, Morella Is Trying to Understand,” 7 November 2002, Washington Post: B8. 24Jo Becker, “Van Hollen Ousts Morella as Voters Swing to Party Line,” 6 November 2002, Washington Post: A32. 26“Election Statistics, 1920 to Present,” http://clerk.house.gov/member_info/electionInfo/index.aspx. 28Congressional Record, Senate, 108th Cong., 1st sess. (11 July 2003): 9310; Congressional Record, Senate, 108th Cong., 1st sess. (31 July 2003): 10527. 29“United States’ Permanent Representative to the OECD,” Organization for Economic Co–operation and Development, http://www.oecd.org/ (accessed 7 January 2004). Papers: 1996-2002, 214.50 linear feet. The papers of Constance Morella document her legislative efforts on such issues as scientific research and development, education, the federal workforce, equity for women, and the environment. The files consist of correspondence, newspaper clippings, press releases, photographs, memorabilia, awards, and subject files. The collection is unprocessed, although a preliminary inventory is available. Papers: In the National Organization for Women, Maryland Chapter Archives, ca. 1969-2002, 19.75 linear feet and 234 items. Persons represented include Constance Morella. Sound Tape Reels: 1986, 7 commercials on 5 sound tape reels. The commercials were used during Constance Morella's campaign for the 1986 U.S. congressional election in District 8 of Maryland, Republican Party. "Constance A. Morella" in Women in Congress, 1917-2006. Prepared under the direction of the Committee on House Administration by the Office of History & Preservation, U.S. House of Representatives. Washington: Government Printing Office, 2006. "I Wasn't Supposed to Win"
The Honorable Constance A. Morella reflects on her personable campaigning efforts in 1986. The Honorable Constance A. Morella remembers working across party lines to find support for legislation.